This Portable A-Frame is great for displaying promotional offers in stores, showing valet parking in events, instructing visitors to stop at entrance. Just insert your sign and place the frame wherever you want. • The Rolling Sidewalk Frame is made of durable plastic and withstands all-weather conditions - enduring winds of up to 30 mph. • The recessed wheels makes it is easy to move and maneuver the frame in and out of your facility. • Sidewalk frame rests on four rubber feet that prevents unwanted movement and averts scratches to interior floor surfaces. • Each ballast port is able to hold 3 quarts of water or sand which helps improve the stability of the unit. • The A-Frame legs feature curved channels that are designed to fit any 24" (w) x 36" - 48" (h) material with a thickness of 4mm (3/16"). 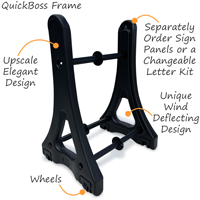 This contour allows any inserted sign component to deflect winds of up to 40+ mph. • Alcoved wheels are suspended above the ground and can be deployed by simply tipping the frame – providing easy transport or maneuverability. • Comes with an EZ Lock system located at the top of the channel columns that prevents theft by installing the 4 included screws to hamper removal of the sign. • Available as kit with stock and customizable message panels for both sides of the unit, or by itself without any insert panels. Easy assembly and they feel sturdy. Solid Plastic Frame- with the option to fill with sand or water for weight. Easy to assemble. Easy to use, good sign for neighborhood. We re-ordered this sign for our subdivision. We are very happy with the durability and performance of this sign frame. Great frame and easy to move around.